Today’s podcast is a follow-up to the Blog Post “Urgent Vendor Setup? Here’s How to Protect Your Vendor Master File” and discussing 8 ways to handle the Internal Team Member and Vendor when you cannot process the request for a new vendor add or change to an existing vendor. Need Help Cleaning the Vendor Master File? Need Vendor Master File training? 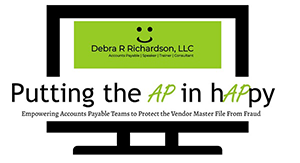 Accounts Payable Gifts - Are you, your co-workers or your team Putting the AP in hAPpy? Listen below and subscribe on iTunes today. For the past eight years, Debra has focused on Global Vendor Maintenance, and implemented a vendor self-registration portal for 140k+ global vendors across five ERPs. 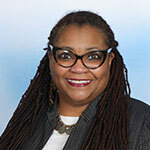 In her consultancy, she focuses on internal controls and authentication to prevent fraud in the vendor master file.